Want to see Maryland's wildlife in action? Great blue heron chicks are out of their shells on the Eastern Shore, and the Chesapeake Conservancy have cameras ready to capture it all. WASHINGTON — From the top of Baltimore’s Transamerica Tower to a wooded area by the Chesapeake Bay, baby birds are breaking out of their shells. And the Chesapeake Conservancy has wildlife cameras ready to capture it all. “We had an extraordinary day,” said Joel Dunn, president and CEO of the Chesapeake Conservancy, a nonprofit that encourages protecting and conserving resources of the bay. On Thursday afternoon, two great blue heron chicks chipped their way out of their eggs in a heron rookery on the Eastern Shore. Moments later, a peregrine falcon chick hatched on the roof of the Transamerica Tower in Baltimore, where its mother had deposited her eggs. Dunn explained that peregrine falcons don’t build nests; they simply lay their eggs on cliffs — or, in this case, on the top of the 40-floor Transamerica building. Wildlife cameras have given humans a bird’s-eye view of the start of life for some of the most striking and emblematic animals of the Chesapeake Bay. Viewers can watch a great blue heron feed the chicks and take extra care settling into the nests — the big birds have wing spans of 6 feet and stand up to 4.5 feet tall. “They look like pterodactyls. They’re beautiful, they’re loud, and they all nest together,” Dunn said, and added that the birds form a sort of colony, with multiple nests close to each other. 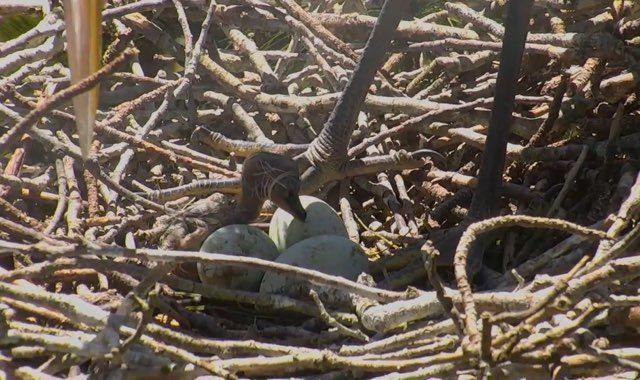 Once the heron chicks are able to fly, Dunn said they’ll leave the nest but continue to trail after their parents for meals until they learn to hunt on their own. Herons have a varied diet: fish, frogs, even small mammals and other smaller birds. And mastering the stalk-and-spear technique their parents employ can take some time. Dunn said herons aren’t endangered; they’re categorized as “low concern,” but habitat loss could be a problem, since their nesting preferences require trees that can accommodate multiple nests that can grow to 4 feet across. The peregrine falcons have quite a comeback story, though, Dunn said. After the species was very nearly eradicated due to widespread use of the pesticide DDT, a peregrine falcon was released near East Baltimore in 1977. Ever since that first falcon made a home on a ledge off the 33rd floor of the Transamerica building, the peregrines have returned again and again. That’s just one of the reasons Dunn is optimistic about the future health of the Chesapeake Bay.